Investors cheered HP's latest round of massive layoffs on Wednesday, forgetting how little the previous swings at this strategy have helped. Image by the author, based on original materials from HP. As Hewlett-Packard (NYSE:HPQ) gets ready to split into two separate businesses, the company is getting its ducks in a row. On Tuesday night, at the end of HP's yearly analyst day, management published financial guidance sheets for both the consumer-minded HP and the business-oriented Hewlett-Packard Enterprise. 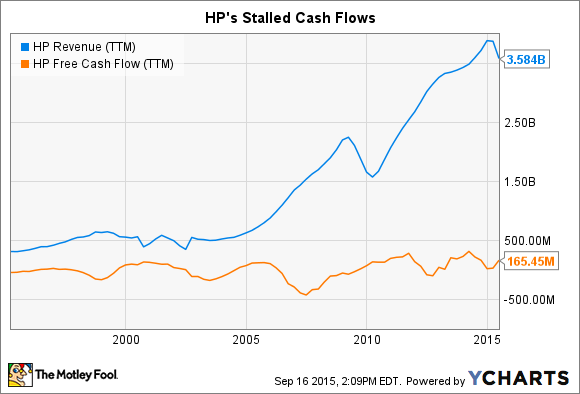 Taken together, the separation is expected to boost HP's annual free cash flows by something like 30%. The main driver of these profit-boosting efficiencies will come from enormous cost-cutting moves in the Enterprise business, removing as many as 30,000 workers from that company's payroll. That's great for HP Enterprise's shareholders in the short run. Savings are savings, even if they undermine the company's innovation and leave the business helpless in the long run. HP shares rose more than 5% on the news, so it's clear that current owners appreciate these moves. Let me just point something out for you. Slicing HP up into two companies opens the door for large headcount reductions. Annual operating costs will dip as much as $2.7 billion lower, which just happens to also be the sum of expected cash flow increases. Makes perfect sense. But we've seen this movie before. Thirteen years ago, HP completed its blockbuster Compaq merger. Back then, CEO Carly Fiorina achieved $2.5 billion of annual cost savings by -- you guessed it -- slashing thousands of names off the combined payroll. Fiorina settled on 15,000 erased positions as the "appropriate" cost-cutting level, and the rest is history. Specifically, nothing happened for several years. When Fiorina left the company in early 2005, handing the reins to noted cost-cutting expert Mark Hurd, HP's stalled sales took off like a rocket although cash flows never followed suit. Hurd removed another 15,000 jobs, including large layoffs in the IT operations department and sharp reductions in HP's R&D budgets. HP Revenue (TTM) data by YCharts. In 2002, HP spent $3.3 billion on research and development, a 26% increase in just two years. That amounted to 5.8% of HP's total revenues. By the end of 2004, R&D budgets had peaked and then backed down to $3.5 billion. That's just 4.3% of HP's annual sales at the time. In 2014, HP still only funneled $3.4 billion into its R&D efforts, or a meager 3% of incoming revenues. In other words, the damage to this famed innovator's corporate culture was made permanent when management paid more attention to immediate bottom-line profits than to long-term sustainability. Long story short, HP's leaders have a 13-year history of wanting their cake and eating it, too. It's beyond me how current CEO Meg Whitman hopes to reap significant cost efficiencies from this split without damaging the two new corporations' research-driven future prospects -- especially since ex-CEO Fiorina made very similar efficiency claims when she combined two large companies instead. As CEO of one company and chairwoman of the other, Whitman gives up very little control over the two-headed business. Meanwhile, she's using the move as a thinly veiled excuse to do more of the obsessive cost-cutting that put HP in a long-term hole to begin with. I still agree that splitting HP up is the right idea, but disagree something fierce with the actual implementation. Once upon a time, I looked forward to this split since it seemed to offer a way back to innovation-driven growth for at least one of the new HP units. In the immortal words of Bob Dylan: Things have changed. I'm now planning to stay away from both HP and Hewlett-Packard Enterprise when they hit the public market in November.